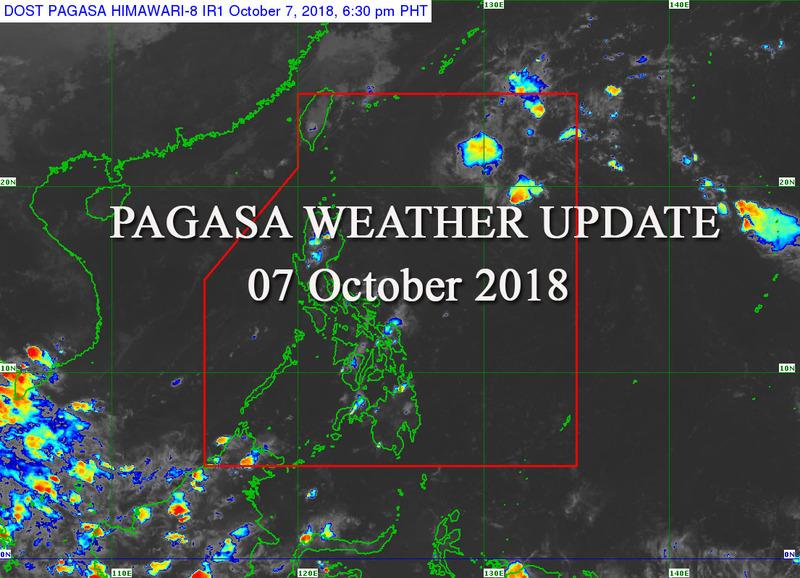 Home PAGASA PAGASA Weather Update for New LPA as of 4:00 PM 07 October 2018. 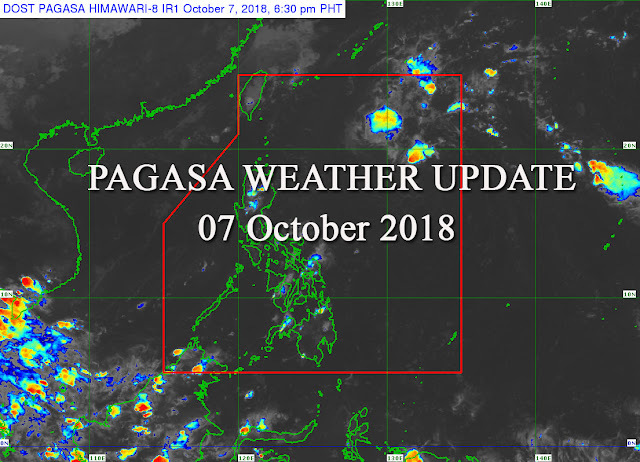 PAGASA Weather Update for New LPA as of 4:00 PM 07 October 2018. Synopsis: At 3:00 PM today, a Low Pressure Area (LPA) was estimated based on all available data at 1,080 km East of Aparri, Cagayan (18.2 N, 132.8 E). Easterlies affecting the eastern section of Mindanao. Southern Luzon - Bahagyang maulap hanggang sa maulap na kalangitan na may pulu-pulong mga pag-ulan o pagkidlat-pagkulog ang iiral sa Rehiyong Bikol, Oriental Mindoro, Romblon, Marinduque at Hilagang Samar. Mahina hanggang sa katamtaman na hangin mula sa hilagang-silangan ang iiral, na may banayad hanggang sa katamtaman na pag-alon ng karagatan. Visayas - Visayas Palawan, Occidental Mindoro will have partly cloudy to cloudy skies with isolated rainshowers or thunderstorms. Light to moderate winds blowing from the Northeast will prevail over Palawan, Occidental Mindoro, and Visayas with slight to moderate seas. Mindanao - Mindanao will have partly cloudy to cloudy skies with isolated rainshowers or thunderstorms due to localized thunderstorms. Light to moderate winds coming from the Northeast and the coastal waters will be slight to moderate.